So true. It is never about love. It is control, pure and simple. 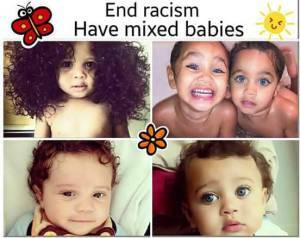 Mixed babies will end racism??? Who believes this nonsense? Having mixed babies/children never ended racism/classism. If anything, it intensifies racism/classism/colorism. Having mixed babies didn’t end slavery. It didn’t end Jim Crow. If anything, it gives white men and women their entitled right to go over and destroy Black peoples around the world. Just look at the U.S., esp. the South, The Midwestern U.S., Brazil, Caribbean, Latin America, Africa(esp. South Africa), and Australia. Those nonblack men and women left a trail of mixed race children. Therefore, having mixed race kids don’t eliminate racism. It only enhance such entrenched racism/white supremacy/colorism. There were lots of biracial babies on the planation during slavery. Did it end racism? People need to stop promoting this delusional nonsense. Here are two good posts dealing with this topic in Brazil. As you’ll see this race mixing talk will not end racism at all.